Why is it often hard to find a ‘Van Accessible’ parking spot? It was a sweltering summer day, and I had been running errands. After my last stop, I was looking forward to heading home with the air conditioning in my ramp van on high. A handicapped space with an adjacent aisle is a welcome sight for those in vans with ramps. In order to enter or exit my van in my wheelchair, I need room on the passenger side for the ramp to extend. There was no room to enter this time. While I had been inside a store, a pickup truck had parked next to my van and was encroaching on the painted hatched lines used to indicate a “van accessible” parking area. I could not get back into the van. I waited outside for 30 minutes, then went inside several businesses in search of the pickup’s owner. I finally found him, explained the situation, and he moved his pickup. I am often asked what it’s like driving with hand controls. It’s really quite easy. Driving is not the problem. The problem is parking. Let me whine a bit. Incidents like the one above happen frequently. With some exceptions, I don’t think most drivers deliberately violate parking laws. They just don’t pay that much attention. I know I never did before my spinal cord disorder. With that I mind, here’s what you need to know about accessible parking. There are two types of accessible parking spots. One has the blue and white “Reserved Parking” signage with the international symbol of accessibility. These are for people in cars who have health problems and don’t require wheelchairs or people with wheelchairs who don‘t use a lift or ramp. 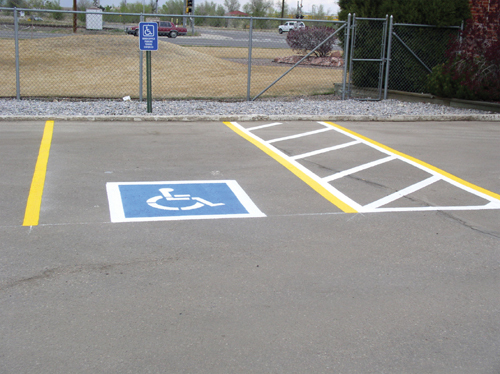 These accessible parking spaces, according to the Americans with Disabilities Act, must have at least a 60-inch-wide access aisle adjacent to the parking space. The aisle has hatched lines to discourage parking and is wide enough to permit a person with a wheelchair or walker to enter or exit the car. These aisles, however, are not wide enough for vans with lifts or ramps. The other type of accessible parking spot has a similar blue sign except at the bottom are the words “van accessible.” These are for ramp vans. This access aisle must be wider - 96 inches - to accommodate persons with disabilities who use a ramp or lift to get in or out of their vehicle. The ADA also sets standards for the minimum number of accessible parking spots per lot. For example: A lot with 300 spots requires 7 accessible spaces. The law also requires that one of eight accessible parking spaces, but always at least one, must be van accessible. So the lot with 300 spaces needs 6 accessible spaces and one van accessible space. Got it? Given all these rules, why do I find it so difficult to find a proper parking place? First, I suspect many folks abuse the system. A disabled parking placard or plate is only valid when being used by the person with the disability or someone who is driving the person with the disability. Violators can be fined up to $1,250 and/or up to 50 hours of community service. I have suspected some people of abusing the system but have never confronted them for one reason: People with disabilities don’t always look disabled. Heart conditions, for example, aren’t always apparent. The other reason I have trouble finding parking is that my ramp van requires a “van accessible” space. As explained earlier, there are fewer of these spots and people who have legitimate disability permits, but don’t have a van, often use the “van accessible” spots even when other spots for the disabled are available. There is no law against this, nor should there be. One suggestion: People with disabled plates or placards should pay closer attention to the type of reserved parking spaces they are taking. The irony of not being able to find an empty “van accessible” spot is that I end up parking in a regular (not reserved) space where nobody will pull up beside me and prevent me from deploying the ramp. This often means I am farther away from my destination than everybody else.